Earns recognition for its newly released Spark Board 55 and the innovative way the touch-based collaboration device is integrated into the Spark platform. Cisco earns top honors in the annual Best of Enterprise Connect Award competition for exhibitors with products and services that best advance enterprise communications and collaboration. Evaluated by a panel of four judges, Cisco's Spark Board 55, announced in late January, was selected as the event's version of best in show from among six finalists. 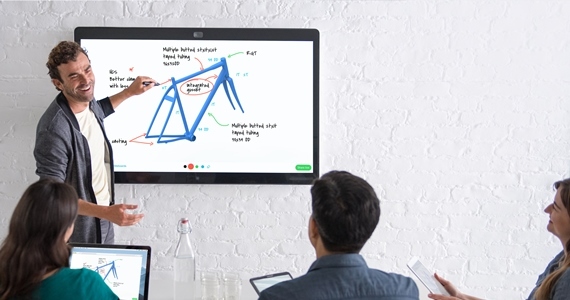 The Spark Board 55 is one of the latest additions to the growing Cisco Spark ecosystem, earning recognition from the judges for its ability to combine wireless presentation, digital whiteboarding, and video conferencing while providing connectivity to the Cisco Spark service for continuous workflow. Following the briefings, judges ranked their top choices; all voting is independent to make it so that any one judge cannot unduly influence the decisions of others. Cisco Spark Board intrigued the judges for the way it fits into the Spark service for real-time collaboration. Participating in this year's judging were: Robin Gareiss, president and founder, Nemertes Research; Zeus Kerravala, founder and principal analyst, ZK Research; Marty Parker, principal consultant, UniComm Consulting, and Co-founder, UCStrategies; and Dave Stein, principal, Stein Technology Group. "Spark board is truly innovative, which is something I look for when judging," said Robin Gareiss. "There were many compelling entries this year, to be clear. What intrigues me about Spark Board is that it changes the way people meet, with two key enablers: the price point is affordable, and the product is intuitive so there will be a low learning curve. Also, the extensibility to multiple devices brings people into the meeting regardless of location. And finally, the ability to store and retrieve documents and drawings for the next call keeps efficiency high." "Cisco is proud to accept this award from Enterprise Connect today. We have received tremendous response for Cisco Spark Board's innovation and design and we are very excited to be honored for our efforts," said Jens Meggers, SVP and GM for Cisco Cloud Collaboration Technology Group, who joined Enterprise Connect Co-chair Beth Schultz on stage to accept the award.